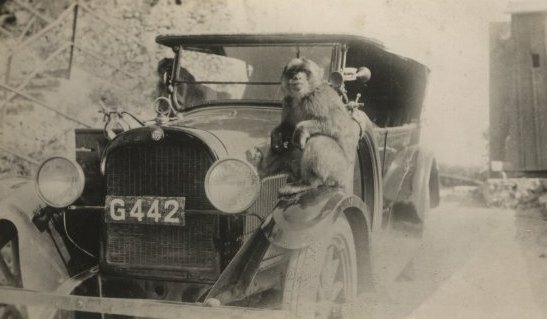 I have never been fond of monkeys – even less those known by the scientific community as Macaca sylvanus who happen to be found in Gibraltar. In those far off days when I lived on the Rock they were known as Rock Apes in English and – much more commonly by me and mine – as los monos. As far as I can remember they were rarely to be seen anywhere near the town. Now and again one brave soul would clamber down Charles V Wall, (see LINK) have a good look at whoever happened to be passing through South Port Gates (see LINK) and then move back to an area of the upper Rock which I either never went to or was banned from going by the local MOD. I have an idea I was not alone in not liking the animals. None of my friends did and I know that my mother found them particularly unpleasant. During the late 19th century my family lived in the old town – specifically in an area known as La Calera by Spanish speaking locals and as Crutchett’s Ramp by others. Whatever the case these animals have been around for ages and if the following article published in “The Friend” magazine is anything to go by, they seem to have been more appreciated by British officers than by the rank and file – or by the locals. 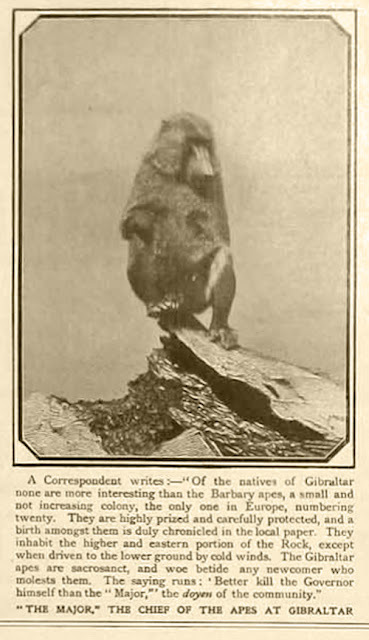 Written by an anonymous “correspondent” in 1834 he had this to say about the “Monkeys at Gibraltar”. 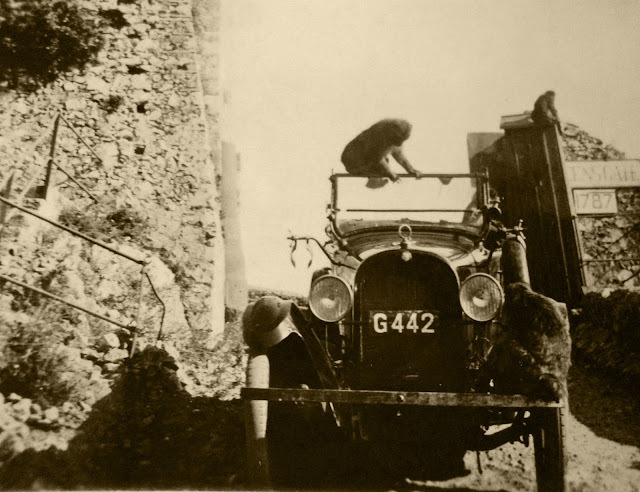 When I was at Gibraltar, the most amusing creatures in the garrison were the wild monkeys that ran about in great numbers on the face of that remarkable rock. As they were constantly seen, they were frequently the subjects of conversation. People used to wonder where they came from, as they are not found in the neighbouring mountains of Spain, nor indeed, in their wild state, in any part of Europe ; and it was equally matter of surprise how they lived on a bare rock that produced nothing but scorpions, lizards, a few black snakes, and, here and there, some dried up and diminutive shrubs that looked as sapless as the rock itself. 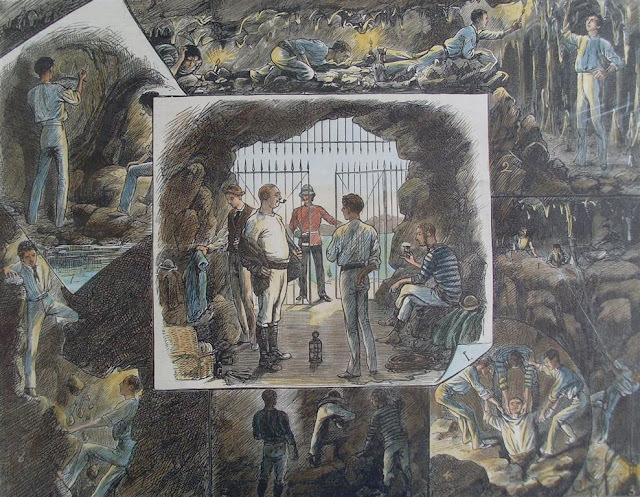 The soldiers and common people, indeed, accounted for all this in a manner perfectly simple and satisfactory to themselves, by assuming, as a certainty, that the celebrated Saint Michael's cave, which has a mouth or entrance near the summit of the Rock of Gibraltar, and which penetrates to a depth that no body as yet has been able to ascertain, is continued under the bed of the sea all across the straits which separate the rock from Africa, and has a corresponding mouth on Mount Abyla, or " Apes' Hill," (as the African mountain is popularly called,) which is just opposite, and abounds with monkeys of precisely the same description. I felt it, however, rather difficult to conceive this double cavern and this connecting tunnel, which must be some sixteen miles long even if it ran in a perfectly straight line, or that the monkeys (supposing such a communication to exist between Europe and Africa) could have used it as a road by which to emigrate; or (another thing included in their theory) that the monkeys continued constantly to use it, going to and fro for their supplies of provisions, &c.
It is not so amusing, but more natural, to suppose that, when the Moors invaded Spain from the opposite coast and settled in Gibraltar, some monkeys were brought over with them; or that, at a more recent period, when the Spaniards, among other possessions in Africa, held Ceuta, in the neighbourhood of Apes’ Hill, that they sent some monkeys to the garrison; then that some of these cunning creatures escaped, and taking refuge in the inaccessible cliffs and caverns which compose so great a part of the rock of Gibraltar, propagated their species at liberty, and laid the foundation of the now numerous and flourishing colony. 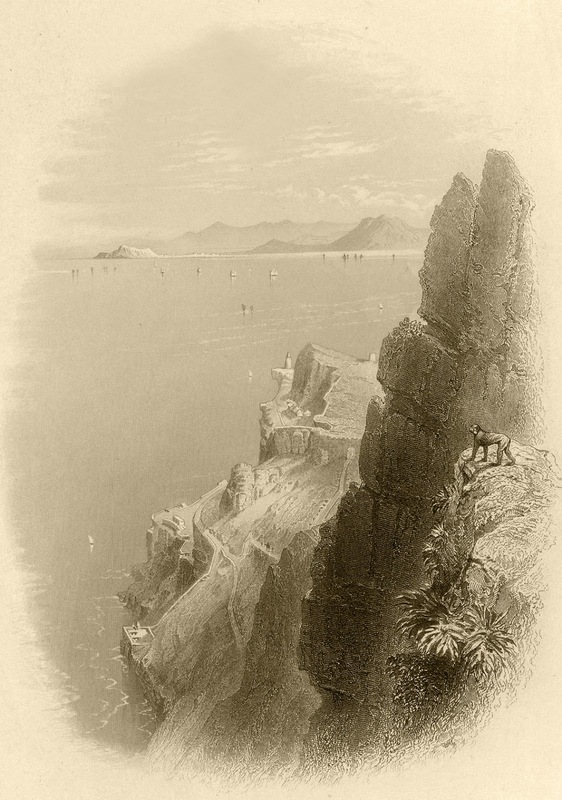 The all but isolated position of Gibraltar, which is joined to the main land by a low, narrow isthmus of sea-sand, which, at no very remote period, has evidently been under water, may account for their remaining confined to that rock and not extending into Spain.In whatever manner they have come, they are, and, as I have said before, in great numbers. On my walks to the upper part and the back of the rock, - which were very frequent in the summer evenings, I scarcely ever returned without having seen many of them. Sometimes going quietly along, and turning the corner of a rock, I would come suddenly on a large party, seated in a circle like neighbours met together for the pleasure of an evening gossip. The rapidity with which they would decamp on such occasions, and the easy way in which they climbed up the steepest rocks, were astonishing. All that I had seen of the gambols of a captive monkey in England was as nothing compared with the feats of these free denizens. They would never stop or make any noise until they reached a position where it was impossible for man to follow them; but when once there in safety, they would face about, mow and chatter, and make the strangest grimaces, as if mocking me. They seemed to be exceedingly gregarious. I do not remember having ever met with them except in rather large parties. In the early part of my residence in the garrison - in the months of May and June - I used often to surprise these monkey parties when they had their young ones with them. These were the most interesting circumstances under which the animals could be seen. Their maternal affection was exemplary. The moment they were surprised, the old ones would take up each her little one on her back and so scamper up the rock, never stopping, as at other times, to chatter and make faces, but they carried their young precisely in the fashion which school boys call pick-a-back. However they might be surprised and close pressed, they never forgot their offspring in their own safety, or retired from the spot without their little ones. On one occasion I in saw the curiosity and turn for imitation, which are so characteristic of their tribe, very amusingly exemplified. 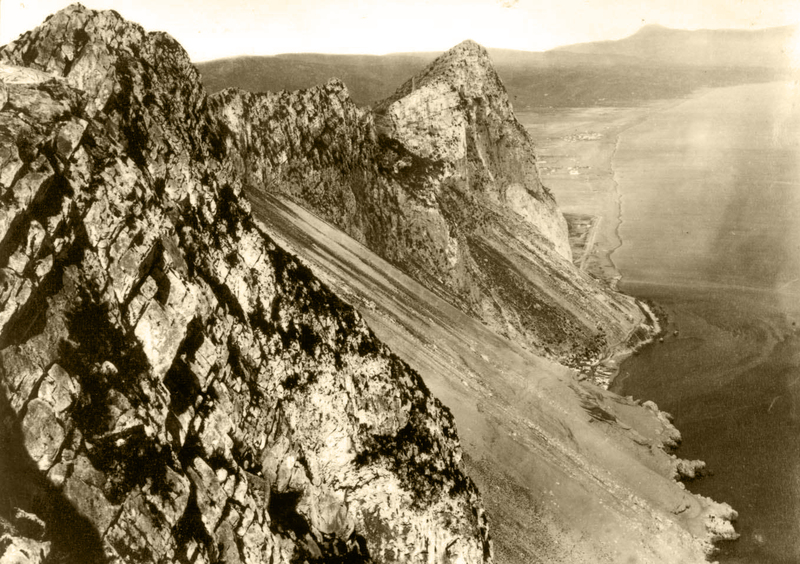 The telegraph, which is situated on one of the loftiest points of the rock, was busily at work; announcing the approach of some ships from the Atlantic. On a ridge of the rock, at a short distance, a partly of about a dozen monkeys had assembled; they sat all with their faces turned towards the signal-house, as though they understood, or were trying to understand, the mystic signs; and every now and then, as the arms of the telegraph swayed up and down, some of them waved their arms in the same manner, as if mimicking or repenting the motion of the machine. Some of these animals are always to be seen on the front of the Rock; but their favourite resorts and strong-holds are at the back of the rock, which, except for a few hundred feet on turning Europa point at the south, and a much shorter space by Catalan bay at the north, consists of towering cliffs which drop almost perpendicularly into the Mediterranean, and afford no footing to man either from above or below. From this place of safely they are, however, frequently driven by the levanters, or strong easterly gales, which beat against the back of the rock with furious violence, and sometimes continue for several days. On these occasions great numbers of them are to be seen; as the monkeys, for shelter, always cross the ridges of the rock and come to its front, or western and more accessible face. Meantime a dirty-gray cloud, or haze, gathers round the summits of the rock and rests motionless upon them, while everywhere else the atmosphere is clear. 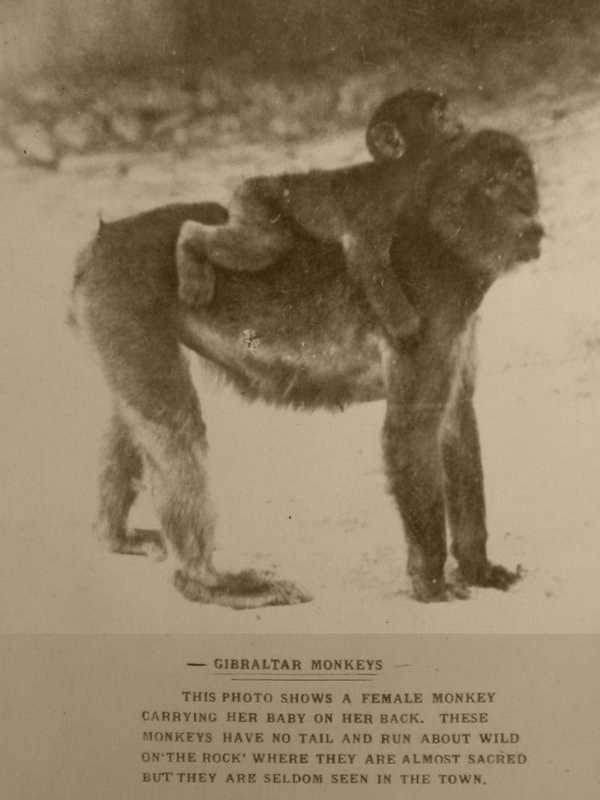 Now, in local parlance, "Old Gib has got his night-cap on,' and whenever this is the case, and the monkeys "are all to the west,"
Gibraltar is a sad place to abide in. I have felt the famed sirocco wind in all its violence on the coast of Sicily and at Malta, but never suffered half so much from it as from the stifling easterly winds at Gibraltar. In my time, the soldiers of the garrison used to say that the monkeys hated the sight of a red coat, and often threw or rolled stones down upon them as they were standing sentinel at the sides of the rock. If they did so, it was only fair retaliation, for the soldiers (particularly the new comers and young recruits) made it one of their principal amusements to hunt and annoy, and lay snares for the poor monkeys. It is scarcely necessary to describe the Gibraltar monkey, as it is the same as the Barbary species, which is one of those most frequently exhibited in our streets by the strolling Italian boys. The size of the body is about equal to that of an Isle of Skye terrier, perhaps rather larger. The colour is a sort of dirty fawn. It has no tail. 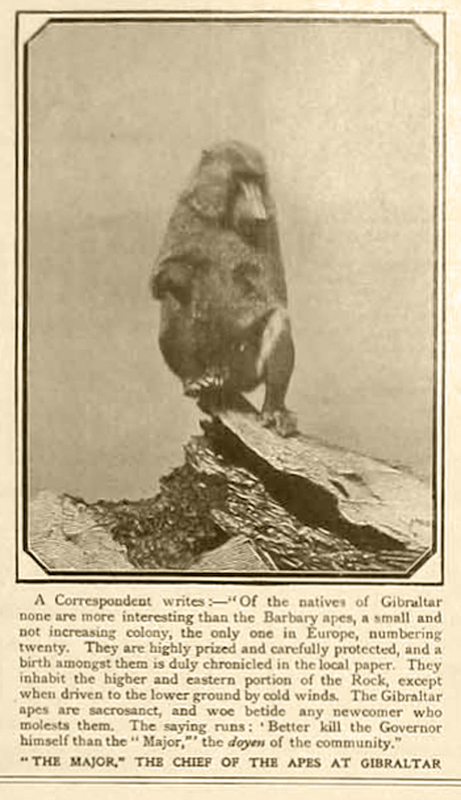 The species is supposed to be found only in Barbary, Gibraltar, and Egypt. (Originally published in the) Penny Magazine. 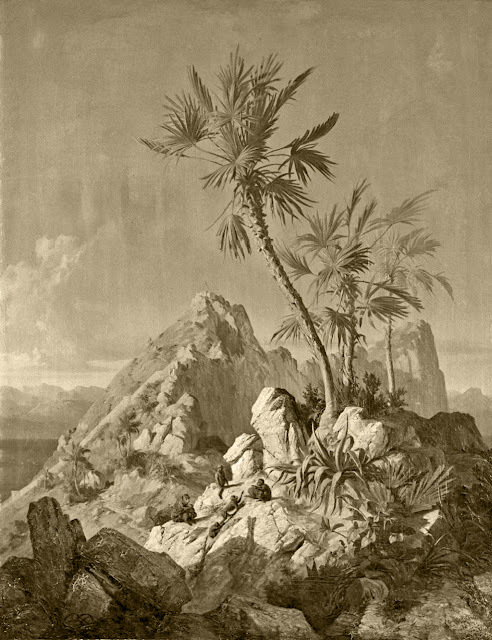 On casting an eye up this barren hill, one would not imagine any living creature could exist upon it ; yet it is inhabited by a numerous species, that occupy the tops of the highest rocks, and who may be said to be the true lords of the hill, whence neither Moors, Spaniards, nor English, have ever been able to dispossess them, I mean the monkies; for so little are they afraid of man, that they often declare war, and act in an hostile manner; not so long ago, they had got the trick of throwing such a number of stones on our miners at work under the head of the rock, that they frequently obliged them to leave off and retire without their reach. Some authorities quote the Spanish historian Ignacio de López de Ayala whose Historia de Gibraltar was published10 years later. As he acknowledges his is just a Spanish translation of Carter’s comment. Others use the following quote from Alonso Hernandez del Portillo´s early 17th century history of Gibraltar . But now let us speak of other and living producers which in spite of the asperity of the rock still maintain themselves in the mountain, there are monkeys, who may be called the true owners, with possession from time immemorial, always tenacious of the dominion, living for the most part on the eastern side in high and inaccessible chasms. The passage does not appear in an undated handwritten digital copy but may have appeared in other versions of the History. One curious omission by the anonymous “correspondent” is the hoary myth that when the apes disappear from the Rock, Gibraltar will no longer be British. In 1942 when the ape population dwindled to seven Winston Churchill took time off from running World War II and ordered replenishments from Africa.